Setting up an electric guitar is not rocket science, but it is something that a lot of guitarists shy away from. True, if you do this wrong, you can make your guitar play badly, but if you learn to do it right, you could save yourself a lot of cash. If the gap is too large, then you need to tighten the truss rod a little (similarly, if the gap is too small, you need to loosen the truss rod). Locate the adjustable end of the truss rod. On my guitar it is at the head of the guitar and uncovered. On some Fender Strats, it is located at the other end of the neck. This is a pain, because every time you want to make an adjustment to the truss rod, you will need to loosen the strings, remove (or partially remove) the neck, adjust the truss rod, re-attach the neck and tighten up the strings again to check the neck bow. Firstly check and, if necessary, adjust the low (thick) E string height. 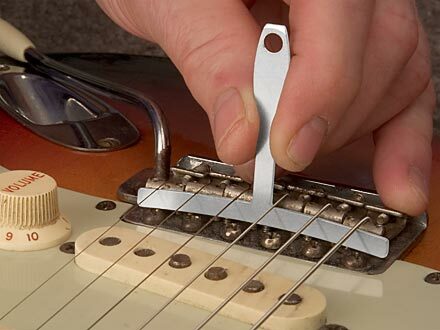 Do this by adjusting the height of the saddle on the bridge/tremolo. If you have a Stratocaster then this is done by screwing two little screws in or out. I recommend that you try to keep these two screws at the same height as each other, although some people would disagree with me. Lay a radius gauge across your strings, close to, but not touching, the saddles. Adjust the remaining strings only (A, D, G & B) until every string is just touching the radius gauge. 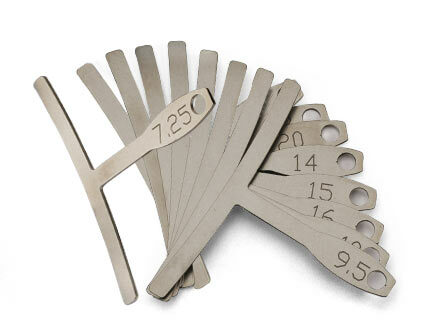 Radius gauges can be bought from numerous sources, or you can make your own. Feel free to use Google at this point if you don’t know about radius gauges. Just make sure that you use a radius gauge that matches the neck of your guitar. Not all Strats have the same neck radius, so the best way is to rest a radius gauge on the neck of your guitar (with the strings removed if necessary) to find out which radius you should be using. I got them from http://www.stewmac.com. Once you have correctly moved the saddle so that both the open string and the 12th fret are in tune, you can move on to the A string. Repeat until all of the strings have been done. That’s a basic setup done. Hopefully your guitar will now be easy to play and appear to be in tune no matter where you play the note. As I mentioned before, sometimes other work needs to be carried out on your guitar to make it play right, such as work on the nut, or a problem with one or more of the machine heads/tuners, but that’s for another day. Also, if you want to set up the pickup height on your Strat, check out this post: http://diystrat.blogspot.com/2014/03/fender-stratocaster-pickup-height.html.